A frog was sent sky-high by a rocket launching from NASA's Wallops Flight Facility on Wallops Island, Va. Image uploaded Sept. 12, 2013. Sorry Kermit, no moon launch for you. A small frog hopping along on Virginia's eastern shore last Friday (Sept. 6) got more than it bargained for when it photobombed NASA's launch of the new moon-bound LADEE spacecraft at Wallops Flight Facility on Wallops Island, Va. 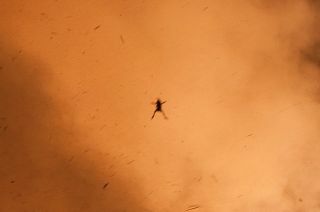 In fact, the launch sent the small creature sky-high and you see the frog photobomb image here. "The photo team confirms the frog is real and was captured in a single frame by one of the remote cameras used to photograph the launch," NASA officials wrote in an image description. "The condition of the frog, however, is uncertain." NASA's Wallops facility neighbors the Wallops Island National Wildlife Refuge. The refuge was established in 1975 when NASA transferred 373 acres of land to the U.S. Fish and Wildlife Service and is home to eagles, owls, migratory birds and other species, according to a description on the service's website. The frog's unfortunate encounter was with a rocket carrying NASA's Lunar Atmosphere and Dust Environment Explorer (LADEE) spacecraft. The robotic LADEE probe is now on a month-long journey to the moon where it is tasked with investigating the mysteries of lunar dust and the moon's thin atmosphere. It is the first moon-bound mission to launch from NASA's Virginia facility. This is not the first time a critter has been adversely affected by a NASA mission. In 2009, a small fruit bat attempted to hitch a ride on the space shuttle Discovery as it launched from the space agency's Kennedy Space Center in Cape Canaveral, Fla. The winged creature clung to the spaceship's external tank throughout the countdown, blasting off with the space shuttle. "Based on images and video, a wildlife expert who provides support to the center said the small creature was a free tail bat that likely had a broken left wing and some problem with its right shoulder or wrist," NASA officials said in 2009. "The animal likely perished quickly during Discovery's climb into orbit." NASA's $280 million LADEE mission launched flawlessly. The probe is currently in an extended checkout phase while in an elliptical orbit around the Earth. LADEE will orbit the planet two more times before performing a major burn on Oct. 6 that is expected to send it into lunar orbit, according to NASA officials.